What’s Missing from Your Safety Culture Strategy? How complete and comprehensive is your safety strategy? Does it have the right ingredients? Do you even have a safety strategy? As we draw nearer to Safety Culture 2018, it’s important to do a little self-assessment when it comes to your current culture and strategy. After reviewing countless corporate, division and location-specific safety strategies, ten essential considerations were frequently excluded. 1. No clear vision. It must be clear what new success will look like. What would the results be, what would be common within the culture, and what would people see and hear that confirms why the results were obtained? This vision should serve as a qualifier that future decisions are made against. 2. Not using data to prioritize. While strategy begins as a hypothesis, data must drive the decisions. What does the data tell you about the opportunities for both safety performance and culture? Are injuries or risk mostly with new employees or seasoned? Run a trend analysis on all commonly tracked variables from incident and injury investigations. What beliefs and behaviors are not aligned currently? What are the common experiences and stories that need to change? 3. Not considering the culture. Are programs deployed with current and future culture in mind? Culture will be why your compliance or advanced efforts fail. It will also be why your overall strategy succeeds or fails. 4. No roadmap. The priorities and initiatives must paint a clear picture of where we are going and why, and what the steps are along the way. 5. Not planning across multiple years. There should be a minimum three- to five-year time horizon that decisions are charted across. What can you really do in year one? What should be deferred to subsequent years? Taking on too much and not following through is a common execution trap. 6. Not aligned with the business strategy/trajectory. Safety strategy must support rather than hinder the overall trajectory of the business decisions. Will growth occur organically or through mergers and acquisitions? Safety should be part of the business decisions, and business leaders should be part of the safety strategy decisions. Safety strategy should not be delegated to the safety leaders. 7. 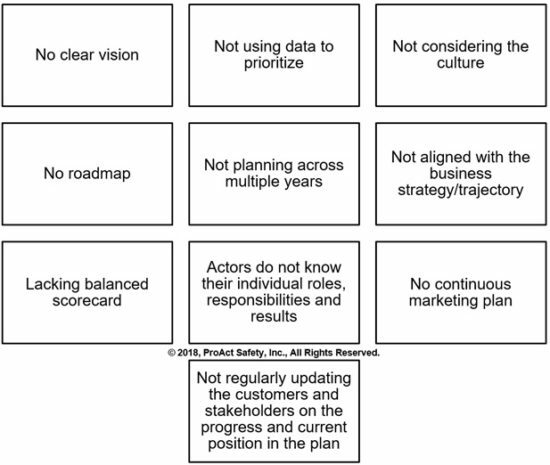 Lacking a balanced scorecard. Measurements should prompt, direct, align, and motivate actions towards the goals, not just tell you end results. There should be leading indicators as well as transformational indicators that validate the efficacy of your choices and the value derived between actions and results. Measurements must explain the why behind a change in results. 8. Actors do not know their individual roles, responsibilities, and results. Individuals at all levels need to see themselves as actors in the strategy, aligned toward the strategy, and held accountable for the performance needed from them to affect the results. 9. No continuous marketing plan. You have to market for discretionary effort. What is the brand and how do you position it? How will you listen and respond to the voice of the customers of your strategy and reinforce the decisions to buy in? The “What’s in it for me?” question never goes away, although the answer changes over time. If you have a great strategy and no one knows it, it isn’t a great strategy. 10. Not regularly updating the customers and stakeholders on the progress and current position in the plan. Customers need to know where they are in the strategy as time passes. It is vital to explain why you now pursue the next area of focus and how it fits within the plan already created. Is your safety strategy yielding the desired results and are they sustaining? Have you targeted aspects of the culture and are they changing? Can you, with confidence, point to precisely why performance and culture have improved? 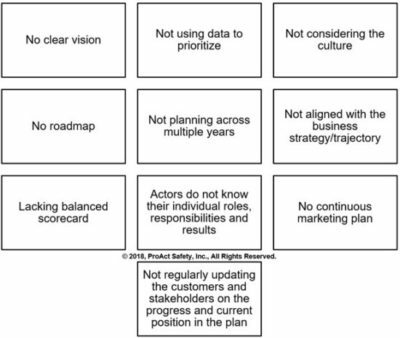 Is everyone in the organization aware of the strategic areas of focus and where they fit within the overall plan? Do they know their individual roles, responsibilities, and expectations? Is the safety strategy supporting or competing with the business strategy, or is it intertwined? Does your strategy have these important ingredients? Join me at Safety Culture 2018, where we can help you find answers to these questions! This article originally appeared in a slightly different format in the April 2018 issue of Occupational Health & Safety. 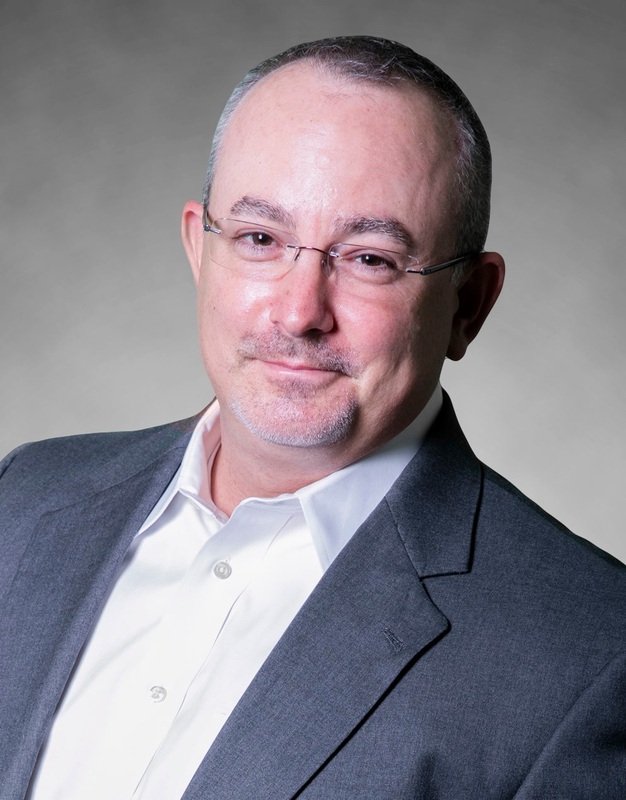 Shawn M. Galloway is the President of ProAct Safety, the coauthor of several bestselling books, and the host of the highly acclaimed weekly podcast series Safety Culture Excellence®. 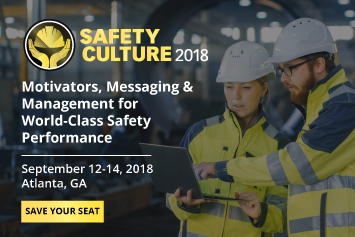 He will be delivering the closing keynote address at the EHS Daily Advisor’s Safety Culture 2018 conference taking place September 12 through 14 in Atlanta, Georgia. Register now for this event!